We love it when we can reuse something instead of throwing it in the garbage. 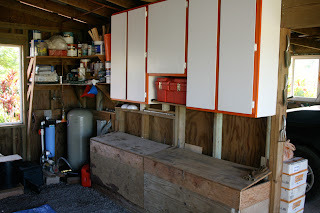 Pictured here are the old cabinets that we tore out when remodeled the kitchen (repainted orange, of course). 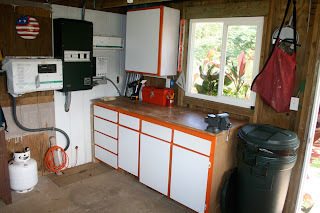 They found new life in the car shed which was in dire need of storage space and counter space to actually work. 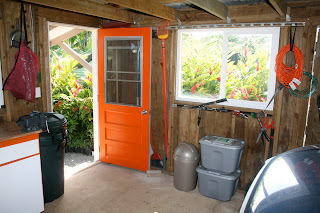 I also finally got around to fixing the door to the garage too. It would never close in a nice, smooth manner. It always had to be tugged shut. I took note of where it hit the jam and planed that area down on the jam and the door itself so now it closes with ease. And while I had the paint out...well you get the idea. It's such a relief to have that work space all organized. thanks... we will be using MORE orange in and on the new structure.